Methods: Patients aged ≥12 years with an asthma diagnosis and asthma medication prescription, followed at outpatient specialist centers in Argentina, Chile, Colombia, and Mexico, were included. The study received all applicable ethical approvals. The Asthma Control Test (ACT) was used to classify patients as having controlled (ACT 20–25) or uncontrolled (ACT ≤19) asthma. Frequency and statistical tests were used to assess the association between hospital admissions/exacerbations/emergency department (ED) visits and uncontrolled asthma; multivariate logistic regression was used to assess the association of uncontrolled asthma with clinical/demographic variables. Results: A total of 594 patients were included. Overall controlled-asthma prevalence was 43.4% (95% confidence interval [CI]: 39.0, 47.4). 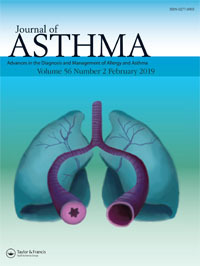 Patients with uncontrolled asthma were more likely to be women (adjusted odds ratio [aOR]: 1.85; p = 0.003), non-white (aOR: 2.14; p < 0.001), obese (aOR: 1.71; p = 0.036), to have a low monthly family income (aOR: 1.75; p = 0.004), to have severe asthma (aOR:1.59; p = 0.26), and, compared with patients with controlled asthma, to have a higher likelihood of asthma exacerbations (34.5% vs. 15.9%; p < 0.001), hospital admissions (6.9% vs. 3.1%; p = 0.042), and ED visits (34.5% vs. 15.9%; p < 0.001) due to asthma. Conclusions: Even in specialist ambulatory services, fewer than half of patients were classified as having controlled asthma. The proportion of uncontrolled patients varied according to clinical and demographic variables.